A bill is making its way through the Ohio Statehouse to require lap/shoulder seat belts on all new and existing school buses. Student transporters weigh in on a proposed June 1, 2019 deadline for mandatory three-point seat belts on school buses, as Rep. John Barnes, Jr. sponsors a bill in the Ohio state House of Representatives. Rep. Barnes introduced HB 680 on May 22, in direct response to an incident just five days earlier, when a Paramus, New Jersey school bus overturned and killed a student and teacher. On the same day, the National Transportation Safety Board convened to review investigations of the fatal 2016 Baltimore and Chattanooga school bus crashes, and subsequently recommended states to mandate lap/shoulder belts on all school buses. The Ohio bill would require all school buses acquired or owned after June 1, 2019, to be “equipped with occupant restraining devices in sufficient number to allow each passenger to use an occupant restraining device,” and it would require a retrofit of existing buses. The bill does not state that school personnel must enforce occupant restraint usage by student riders or mention potential funding sources. The rule would apply to buses purchased with public funds, whether they were bought by schools, school districts, charter schools, government entities or individuals. Failure to comply would be considered a minor misdemeanor. The Ohio Association for Pupil Transportation posted the news on its Facebook page, and received more than a few comments that were skeptical of or opposed to the idea. “What happens if the bus catches on fire? How are small children going to get out of the bus? What happens when children are fighting and they use the seatbelt to harm another student? Who is going to make sure the students have their seatbelt on? School buses are made for safety and the safest form of transportation. I don’t understand the reasoning behind this new law,” one commenter wrote. “Does anyone have an estimate of what it will cost? It would be a good idea for ODE (Ohio Department of Education) to give us the number of buses total in the state and get a number from a bus dealership to retrofit a bus. Then we can have actual numbers to give Mr. Barnes,” wrote another member. The commenter went on to propose that a bus aide would likely be necessary on all buses, to ensure students wore the seat belts. “… The seats in the bus are safe now. I’m for safety. I just don’t believe this is any better than what we do now,” she finished. “It might be a good idea to ask (Rep. Barnes) what his plan is to address a potentially unfunded mandate?,” OAPT suggested in response to a Facebook commenter. STN reached out to Brian Jones, the executive director of the Ohio Department of Education, for further comment on the concerns that were raised, but had not heard back as of this report. “Right now I’m trying to get the law passed that will require it, and I think I’m going to let the school districts figure out how they can do that,” he added. Paramus Board of Education in New Jersey, which recently approved an additional $5,324.38 for each of the four new buses the district is buying with lap/shoulder belts, in response to a fatal field trip crash last month, provides insight into how much Ohio student transporters might need to spend. Using the most recent data supplied by the Ohio Department of Education, the state has approximately 19,450 school buses in route service. Charlie Vits, market development manager for seating and occupant restraint provider SafeGuard, confirmed that new seats with lap/shoulder belts could cost $7,000-$10,000, depending on how many are bought, who they are bought from, the location of the supplier and what features are included. After adding in costs for labor—which includes pulling up the old seats, plugging up holes in the floor, disposing of the old seats, drilling new holes, laying out the new seats and correctly installing them—the final price for the retrofit could reach $10,000 to $17,000. Sandra Laxson, owner of Texas-based parts and service supplier Buck’s Wheel & Equipment, said the cost of retrofitting lap/shoulder seat belts on a 77-passenger Type-C school bus could be as much as $20,000. For example, washing the bus out with a hose can cause rotting of the floor. Depending on the condition of the flooring, the company estimated that an additional $4,000 may be needed. He also could not answer the concern expressed by some student transporters that mandating lap/shoulder seat belts could result in fewer school bus purchases and could reduce overall student ridership. He suggested that the cost could be brought down by having district maintenance employees perform the necessary retrofits. Laxson, however, said she has seen many districts wary of taking on liability by having their employees retrofit school buses with new seats equipped with seat belts. The involved, time-consuming process of retrofitting is another potential barrier to the proposed June 1, 2019 implementation date for the law. Barnes, meanwhile, said he “had received some very positive calls” about HB 680, but did not clarify if any were from school districts. Neither is there language directing districts to make sure students wear the belts. Barnes said he did not want to tamper with district autonomy, but he advised districts to consider the improved behavior that can result from use of the belts, a trend STN has previously reported on. He predicted that bullying is likely to decrease as well. Though costs are currently a barrier to the adoption of the occupant restraints, “OEMs are trying to be a lot more competitive,” resulting in the price of seats and school buses equipped with lap/shoulder belts decreasing over the years, said Vits. Like many things, prices “come down as volume, technology, everything improves,” he added. After its introduction, the bill was referred to the House Education & Career Readiness Committee. At its first hearing on June 19, Rep. Barnes pointed out statistics from the National Highway Traffic Safety Administration showing that 1,313 people had been killed in school transportation-related crashes between 2006 and 2015. However, only 9 percent of those fatalities were school bus occupants. “Sixty percent of Ohio’s students ride on school buses each day and nearly 15,000 buses provide safe transportation for children in the state. National studies show school buses are the safest method for transportation of young people—nearly 30 times safer than passenger cars,” read a statement on the Ohio Department of Education’s Pupil Transportation Office website. HB 680 also designates the third full week in October as “School Bus Safety Week” in the state, to coincide with similar events held throughout the U.S. 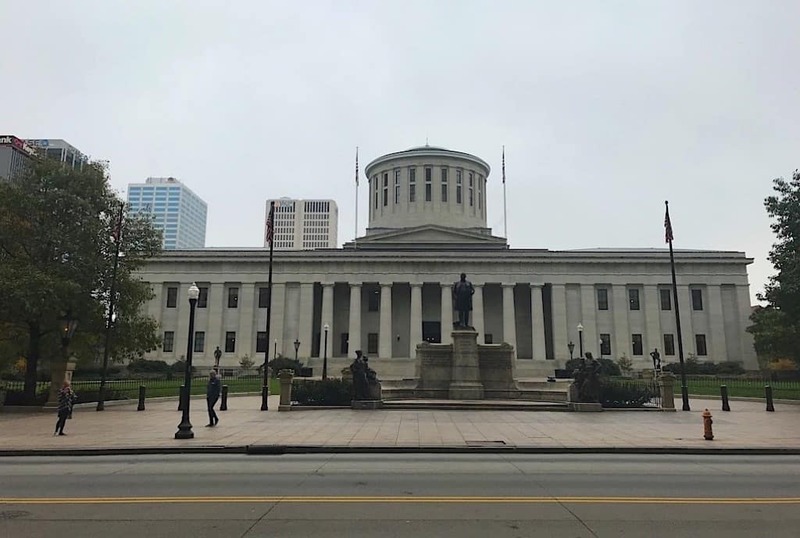 The Ohio legislative session is year round, but WOWKTV.com reported that lawmakers will soon be going on a summer break until after the general elections in November.